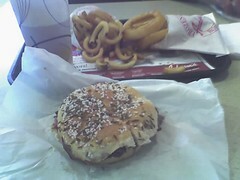 Completing the Buffalo food trifecta (along with Ted's and wings), we stopped at Anderson's on Main Street for beef on weck (after picking up some great homegrown produce at Spoth's on Transit Road). The Kimmelweck roll is what makes the "beef on weck" sandwich so spectacular-- essentially a kaiser roll with salt and caraway seeds on top, it's a perfect complement to the thinly sliced top sirloin, [au] jus, and horseradish. Unfortunately, I was too stuffed after the sandwich to have Anderson's specialty: frozen custard. Smooth and rich but light in texture, there's always a daily special flavor (today's was banana) in addition to the regular chocolate and vanilla. The special can be mixed with vanilla in a twist, though I usually go for a small chocolate-vanilla twist in a sugar cone if the special isn't cinammon or black raspberry. 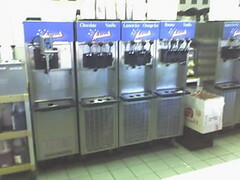 Anyway, here's a shot of the custard machines-- that was all I could stomach after the beef on weck, curly fries, and loganberry.